Comet 302679A. Comet Industries 500 Series Drive Clutch. 7/8” Bore. Comet/Brister’s Part 302679-A. 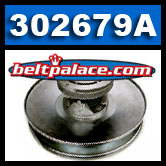 Home > COMET INDUSTRIES BELTS > Comet 300666 (A-C) Drive Belt. Comet Industries 300666-704126 BELT. > Comet 300661 Go Kart, Golf Cart, and ATV Belt. > Comet 300315A SPRING FOR 858 Series TORQUE CONVERTER - "NATURAL" COMET 858 DRIVEN Clutch. > COMET 300621, Comet Industries belt replacement for 500/858 Series, 704039 Go Kart belt. > Comet 302679A. Comet Industries 500 Series Driven Clutch. 7/8” Bore. Comet/Brister’s Part 302679-A. Comet 302679A. Comet Industries 500 Series Driven Clutch. 7/8” Bore. Comet/Brister’s Part 302679-A. Fits 7/8" Shaft, 7.5" diameter, 32 Deg. Cam, Green Coil Spring, Requires 7/8” (.92”) top width Comet CVT belt. 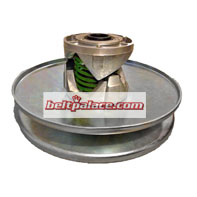 Comet 500 Series Secondary Pulley: 7/8” Bore, for UTV (Brister’s Chuck Wagon). Use ONLY with Comet Industries Symmetric 7/8" Wide torque converter belts! This Comet 302679A torque converter is made in USA by Comet Industries!